And then there were eight. 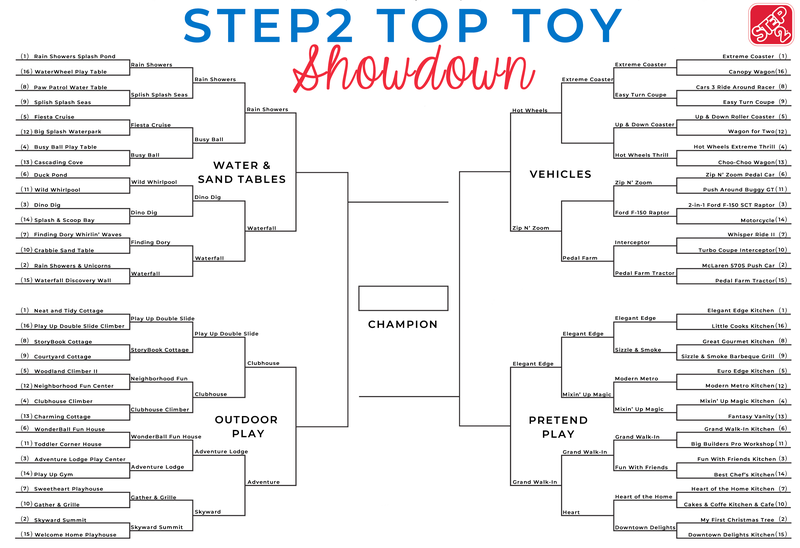 Only eight toys remain in the Step2 Top Toy Showdown! Are you surprised with any of the upsets so far? In a surprising move, we have a Cinderella story unfolding before our very eyes. The final matchup in the Water and Sand Tables Region is between a #1 seed and a #15 seed. It was close but the Waterfall Discovery Wall just edged out the Dino Dig Sand & Water Table to earn its spot in the Elite Eight. Vote for the remaining items and help us crown our Top Toy Showdown champion! Voting for the Elite Eight opens at 8:00 am ET on Friday (3/29) and will run until 8:00 pm ET on Sunday (3/31). The winners will advance to the Final Four, and new polls will open on Monday (4/1). We love our grand walk in kitchen!!!! 2 that I picked seemed to be the most popular and 2 weren’t. Guess it’s a 50/50 day for me in the voting category at least. Your products last forever. I think they make the hand me downs at the top of the list.